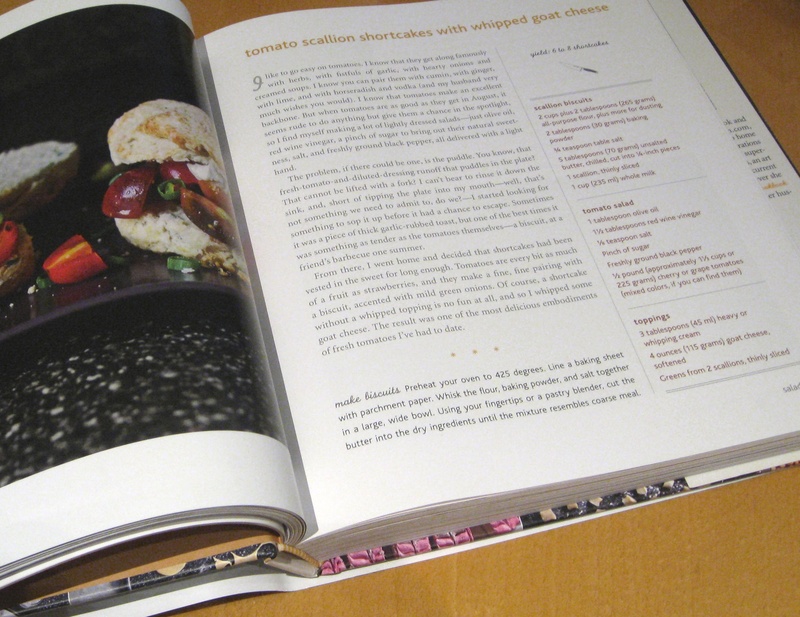 One of the first things that F and I did upon my arrival in London was look at every single recipe in the smitten kitchen cookbook, which I gave to F for Christmas. It is gorgeous. Since I arrived on a Friday, we decided to pick a couple of recipes to shop for and cook on the weekend. Up first: Tomato Scallion Shortcakes with Whipped Goat Cheese for Sunday brunch. I followed the recipe rather closely, only having to improvise with 1% milk + whipping cream in place of the whole milk in the biscuits. And F inadvertently made the wrong dressing — I’d turned the page to read the biscuit-making instructions and he made the dressing on the right-hand page, not noticing that it was a different recipe! 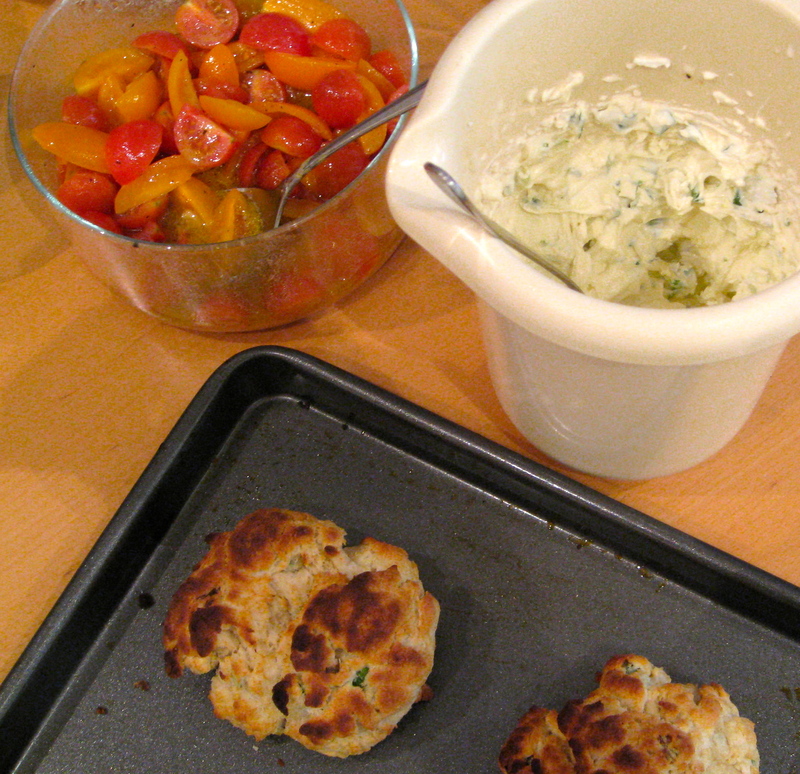 No matter — the mustard vinaigrette was a great accompaniment to the tomatoes, goat cheese and biscuits. This isn’t the healthiest recipe in the world, but it could certainly be worse and something about eating tomatoes for breakfast makes me feel virtuous. Make biscuits: Preheat the oven to 425F (215C). Whisk the flour, baking powder and salt together in a large bowl. Work in the butter with your fingertips until the mixture becomes like a coarse meal. Mix in the scallion and milk, combining until dough forms. Pull off pieces of the dough and form them into patties. Arrange them on a baking sheet and bake for 10-15′ or until they are golden-brown. Salad: Whisk together the dressing ingredients, then cut the tomatoes and mix them with the dressing. Whipped Goat Cheese: Whip the cream with an electric mixer until peaks form, then add the goat cheese and scallions and beat until the mixture becomes light and fluffy. Serve the biscuits halved and topped with scoops of salad and a dollop or two of whipped goat cheese. This entry was posted in food, full meals, health, pictures, recipes and tagged biscuits, breakfast, brunch on 06.01.2013 by taplatt.